Yet another Marvel classic leapt onto the big screen this past month. 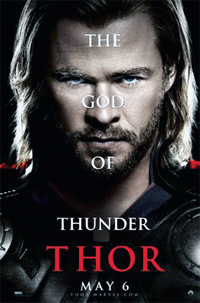 “Thor” hit theaters May 6, and the comic’s version of the god of thunder is taking the world by storm. The epic flick, directed by Kenneth Branagh and starring Chris Hemsworth as the titular god, tells the story of the arrogant Norse thunder god Thor’s fall from grace when he goes against his father’s wishes. His subsequent redemption and return to his place in Asgard, the Norse god’s home, forms the bulk of the movie. The special effects in this film are incredible. The renderings of Asgard are breathtaking, sweeping panoramic views of a golden city in the clouds. And the fight scenes are believable, with effects used judiciously enough that the audience never loses the suspension of disbelief. The cast gives their all, every single member turning in deep, powerful performances that stay true to the characters while showcasing the actor’s skills. Special mention needs to be made for two of the cast. First, Anthony Hopkins’ performance as Odin is deliciously mysterious. Viewers have no trouble believing that the veteran actor really does know and see all, and the presence Hopkins brings to the screen makes him perfect for the role. Second, Clark Gregg as the imperturbable S.H.I.E.LD. Agent Coulson. Although the role only requires Gregg to play a faceless and unflappable man in black, Gregg’s timing and humor shine through, giving the character a variety and depth that make the character anything but forgettable. “Thor” is laced with humor, which may throw off fans expecting the Asgard to be portrayed with pomp and majesty. But the humor often carries the story, more than making up for the movie’s only downside: there really isn’t enough plot. At times, the movie feels like the pilot episode for a cable show, with lots of little story arcs running through it, hiding the fact that the main storyline could probably be covered in half an hour. But the other elements skillfully cover that fact without boring the audience or making use of overt filler. With a rating of PG-13, “Thor” is not really a children’s movie, due largely to violence. But for the rest of the family, it’s definitely a must see. Because the greatest thing about this film is that it offers a mix of innocence and worldliness that will appeal to all ages.